In Chicago, they are preventing lead poisoning in young children. In Chatham County, Georgia, they are building a continuity of care system for jail inmates, and in Washington State, they are using multiple data sets to coordinate care for dual-eligibles. 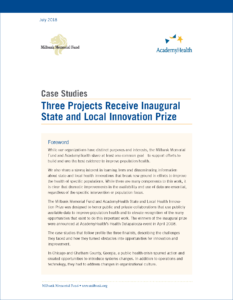 Meet the winners of the inaugural Milbank Memorial Fund and AcademyHealth State and Local Innovation Prize, developed to recognize state and local efforts to leverage data to improve the health of populations and the performance of health systems. These case studies tell the story of the three winning projects—the problems they solved, the inspiration behind their developments, and the opportunities for innovation they uncovered. It is our hope that these case studies—and the new annual prize—will continue to demonstrate how the smart use of data is critical to transforming health care delivery.